Chess, Annabelle: Sit down. We need to talk. You two ladies are entertaining messes, and I've thoroughly enjoyed your exploits so far. But the time has come to consider your self-destructive ways. Thankfully, in your new books, it appears that you're both coming to that realization, too. 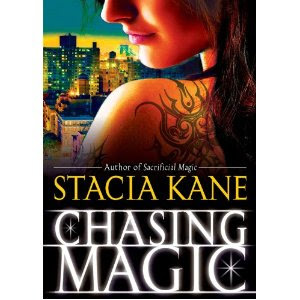 Chess, the newest book in the Downside Ghosts series, Chasing Magic, comes out today. And Annabelle, Blood on the Bayou, the second book in your evil fairy series, was published in March. I'd like to talk to each of you about squishy stuff like personal growth, if that's OK with you. Chess, Chasing Magic follows perhaps the darkest entry in your series, Sacrificial Magic. I'll be honest; the previous book was tough to read. I had my concerns that you'd continue down your path of pill addiction and crippling self esteem issues that keep you from accepting love and support when it's offered. In Chasing Magic, you're the same Chess, facing down the grim reality of murderous ghosts and a generally hopeless population. But at the same time, you're learning to trust, and you're taking baby steps in a direction I've been hoping you'd head since the first book. This novel deals with a gang turf war and some dangerous new drugs, and it forces you to confront your own decisions and their effects on those around you. As always, you face the deadly magical challenges with selfless bravery and street smarts, and you face the sticky personal challenges with fear, pessimism and panic. This book offers you both a personal triumph and a heartbreaking personal set-back. Even more than before, I'm curious what you'll do next. For the first time in many books, I'm optimistic that you're headed someplace better than where you've been. Also, Terrible is still awesome. You've fallen for the most appealing lethal gang enforcer around. Good on ya. Annabelle, it is now your turn. Laurie was crazy about your first book, Dead on the Delta, and I agreed with her. You live in a scary, unique world of deadly mutated fairies that force people to live in towns surrounded by iron bars to keep out the bloodthirsty little monsters. Sure, you drink more than you should, often during the daylight hours, but you're quite aware that this is a problem. Blood on the Bayou finds you helping your ex-lover, Hitch, as he tries to stamp out a criminal cabal mucking around in the swamps. At the same time, you learn some startling things about yourself and about the fairies infesting the bayou. These revelations are welcome, and they add a layer of intrigue and complexity to an already compelling urban fantasy setting. I look forward to seeing how they play out in future books, particularly your burgeoning paranormal skills following a fairy bite in book 1. However, your personal life is making it hard to focus on the evil creatures out to destroy all humankind. The love triangle from the first book has now swelled to a love rhombus, and it threatens to consume all that it touches. You love this one, you yearn for that one, you make out with this other one. Pull yourself together, lady. I'm not saying you have to settle down with one person immediately, but the bouncing between men gets in the way of the far more interesting storylines about fairy origins and government conspiracies. Listen, I like romantic tension and brooding heroes as much as the next reader, but it's got to be balanced with plot advancement. 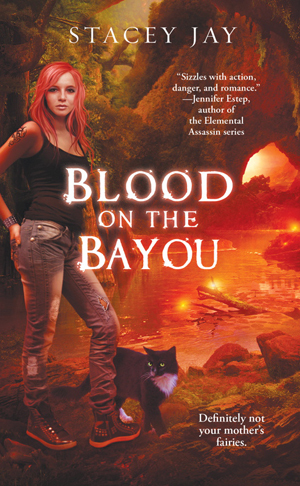 Blood on the Bayou flounders a bit in the swamp of relationship drama. Another concern I have is the speedy 180-degree turn your life has done in the book's epilogue. Talk about whiplash. I'm intrigued about where you're headed, but geez, you skipped a lot of steps in the storytelling process to get there. Here's hoping the third book will give us some insight into how that all came to be. Also, Gimpy is still awesome. Woe be it unto you if you can't figure out how to get that cat the help he needs in book 3. Stacia Kane writes the Chess Putnam Downside Ghosts series, and Stacey Jay writes the Annabelle Lee series. I recommend you give them both a try if you haven't already.